A "cooperative" or "co-op" is defined as a group of people coming together in a joint effort. A cooperative preschool is a group of parents joining together to educate their young children. At Novi Co-Op Preschool we hire professional teachers to develop the curriculum, teach all classes, and guide each child through their school day. A cooperative preschool is a non-profit organization owned and operated by the parents of the children enrolled. The parents assist the professional teachers in the classroom on a rotating basis and participate in the classroom activities. Each family shares in the operation of the school, thus making it truly a cooperative venture. Volunteer parents serving on a board position manage the business side of the co-op. Board members are elected each spring and meet once a month to decide on polices and guidelines for the operation of the school. 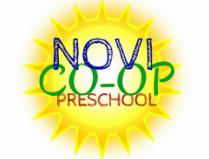 At Novi Co-Op Preschool parents, teachers, and children learn together, play together, and grow together. For more information about co-op preschools we recommend you visit The Greater Detroit Cooperative Preschool Teacher's Association website.